If I had to pick a favorite fairy tale (and how could I ever do that?) than Vasilisa the Beautiful would be in the top two or three. I’ve always loved Russian folklore and this tale is a wonderful one. It has Baba Yaga and skulls with glowing eyes and a matryoshka doll that talks. Actually, I think my love of the tale comes from the lavish illustrations of Ivan Biliban. As a child, my mother gave me a book of Russian folktales with his amazing illustrations. So, it was probably the pictures that first drew me to these stories, but there’s something really magical about his work. Vasilisa the Beautiful is a tale I had mixed feelings about illustrating for the Poppets, as the heroine is a grown woman rather than a child, but since I did Rapunzel (and Rapunzel gets pregnant) I though it would be okay. The paper doll costume for Vasilisa the Beautiful that I designed is based on traditional Russian clothing. She wears a sarafan over a blouse. Here’s a lavish version from The Met. The headscarf was inspired by matryoshka dolls who you often see wearing them. She has, of course, her own matryoshka doll as an accessory. I didn’t draw more than one, because one seemed enough. When I was a child, my mother had a handmade set of matryoshka doll’s that came from Russia when it was the Soviet Union. They were precious to her and I remember playing with them as a child. I’ve always wanted a set of my own to display. Anyway, I hope everyone has been enjoying the Fairy Tale and Nursery Rhyme series for the Poppets. 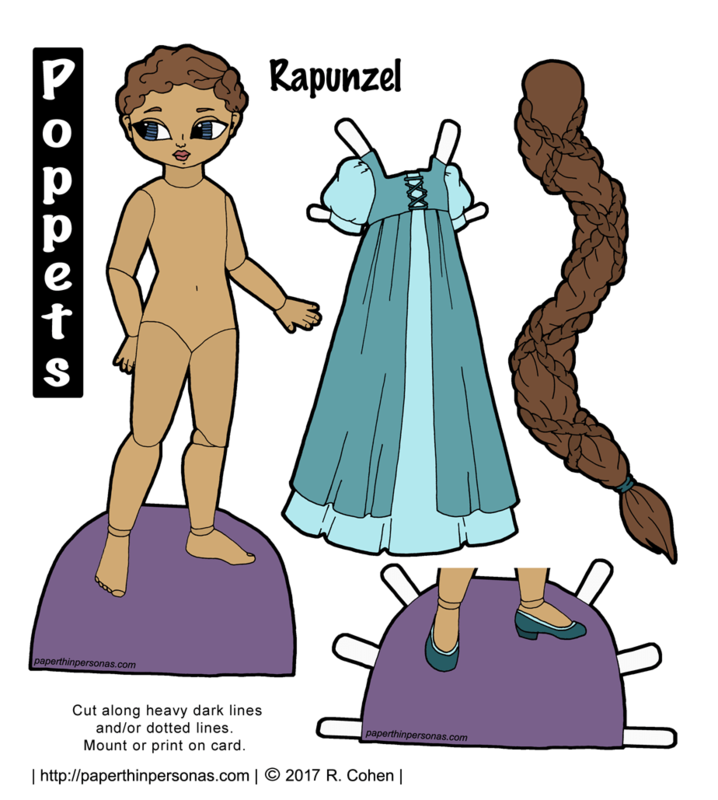 The Fairy Tale and Nursery Rhyme series continues today with a Rapunzel paper doll. Certain fairy tales need a doll to really share them. After all, Rapunzel is only Rapunzel if she has super long hair. After some technical debate about how to mange the super long hair, I decided to make the braid a separate piece, so that it could be pasted to the back of the head. That way you an easily slip the tabs around the paper doll’s body. One of the challenges of depicting fairy tales is the overwhelming presence of Disney. If you search for images of Rapunzel, the images from the Disney film Tangled overwhelm all other depictions. The last thing I wanted to do was copy Disney and I don’t really like their version of Rapunzel, so I decided there was going to be no pink in my version. My Fairy Tales and Nursery Rhymes board on Pinterest to see the non-Disney related images I used to inspire my version of Rapunzel. The Fairy Tale and Nursery Rhyme series contains a lot more storybook characters. There’s currently six paper dolls and outfits in the series, but I have a few more waiting in the wings. So, I did a little research on the rhyme. It turns out that its origins are unclear (not uncommon in nursery rhymes) and it was first published in 1805. The truth is that you will sing ANYTHING to a baby to get it to stop crying (trust me, I know) which means many nursery songs have their origins in popular or political ballads. 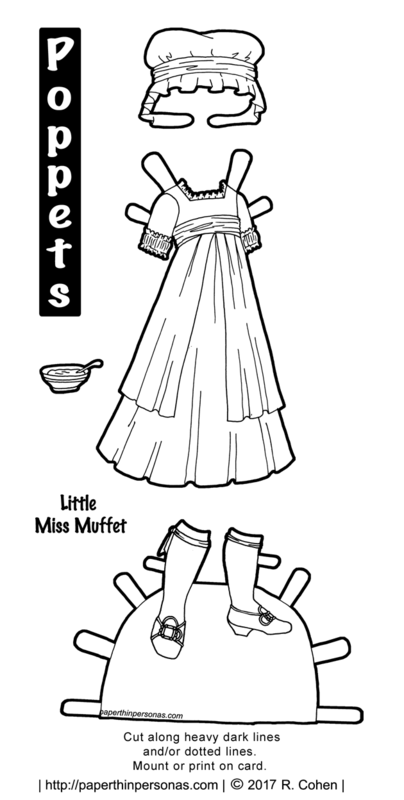 When designing today’s Little Miss Muffet costume, I wanted something that was colored with cream accents, rather than cream with colored accents. I was inspired by Kate Greenaway‘s illustrations, but only in the sense that I like her work and always tend to think of it when I start drawing late 18th century inspired children’s clothing. Okay, I know the rhyme involves a spider, but I am not a big fan of spiders and I was not about to draw one. Deal with it. Instead I made a bowl of curds and whey, which is a dish I’ve never eaten or really know anyone who has eaten. Have any of you, fair readers, actually eaten it? I know it’s a dairy dish, since curds and whey are both part of the cheese making process. Her shoes are pretty classic 18th century style (you can see a bunch more like them on my 18th Century Clothing Pinterest Board). She also has a mob-cap which may or may not fit depending on which Poppet doll you put it on. 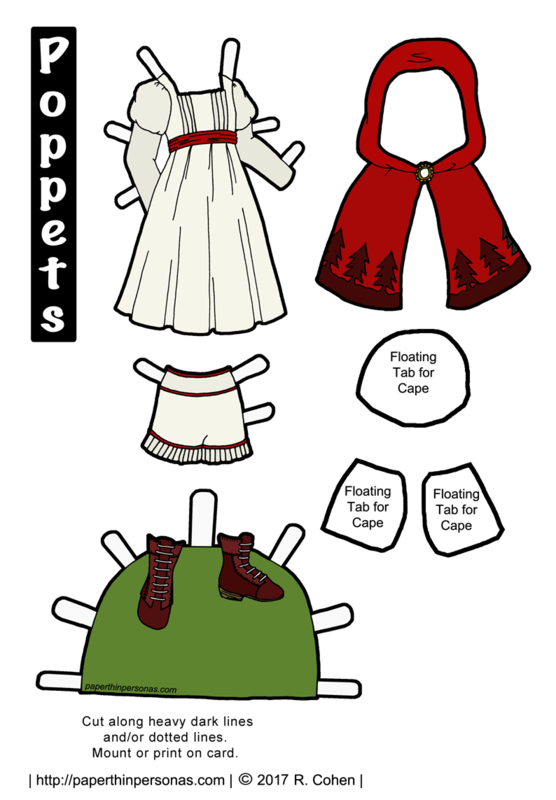 You can check out my Fairy Tales and Nursery Rhymes board on Pinterest to see some more of my inspirational images and, of course, you can check out the rest of the Fairy Tale and Nursery Rhyme series for more fairy tale and nursery rhyme inspired paper dolls and outfits. 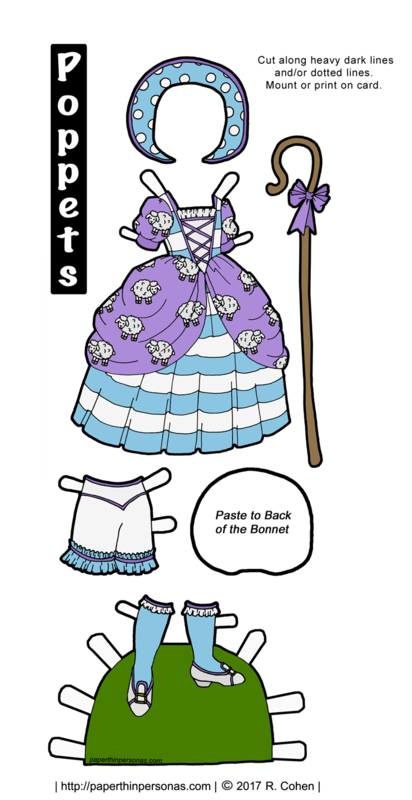 Today’s paper doll dress is part of the Poppet’s Fairy Tale and Nursery Rhyme Collection where I draw designs for different fairy tales. Today’s tale is Little Red Riding Hood. I knew from fairly early on that I would want to create a Little Red Riding Hood outfit. I don’t really feel like I need to recap Little Red Riding Hood, as it is a pretty well-known tale- girl goes into woods, girl meets wolf, girl gets eaten. Depending on the version you read, that’s how it ends. Little girl and grandma devoured by wolf. In most modern tales, there is a friendly Woodcutter who saves the day, but in the early versions of the tale there was no Wood cutter. The woods, in Little Red Riding Hood, are generally treated as a metaphor for growing up or recognizing a space where the rules of civilized society fail to function. The play Into the Woods takes this metaphor and really runs with it. 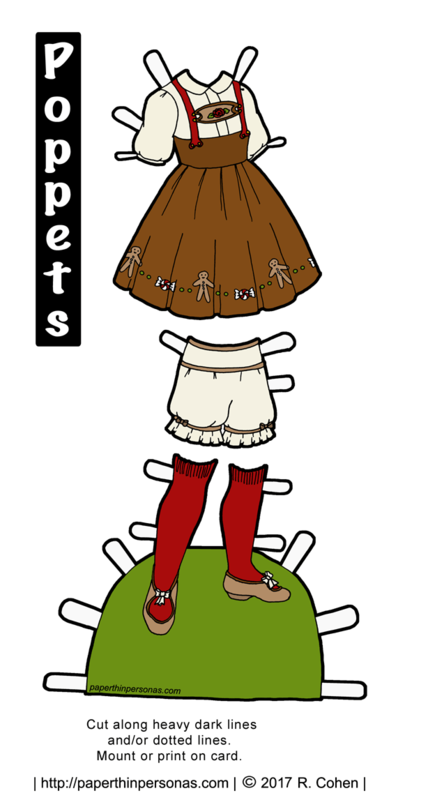 This is actually one of my favorite designs I’ve done so far for the Poppet’s Fairy Tales and Nursery Rhymes Poppet paper doll series. I knew from the beginning that I wanted to create a reference to the Woods in the story of Little Red Riding Hood. So, I created this trim on the bottom of the hood to reflect the deep dark woods. Because of the shape of the hood, I designed floating tabs to be attached to the back of the hood to hold it onto the doll. Her boots are a reddish brown leather and her dress is cream and inspired a little by the children’s illustrator Kate Greenaway. 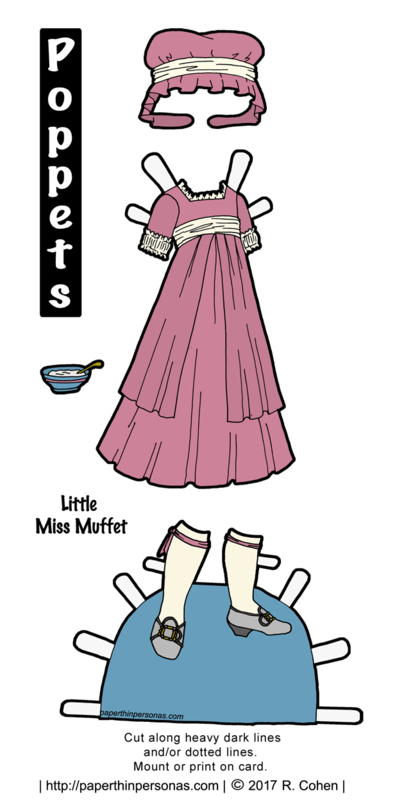 Of course, you can see the other tales I’ve illustrated in the Fairy Tales and Nursery Rhymes Poppet paper doll series tag. If there’s one I haven’t done that you would like to see, let me know in a comment. I hope everyone has a great Memorial Day weekend here in the United States. 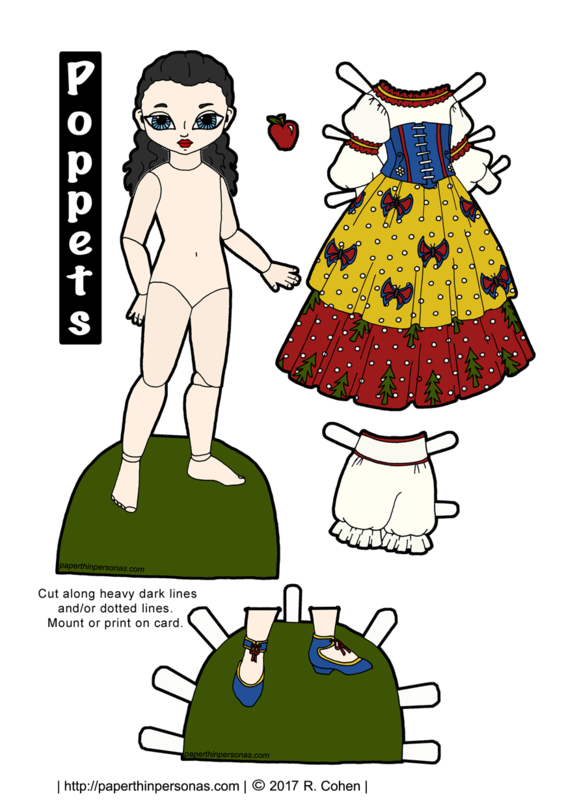 The new addition to the Fairy Tales and Nursery Rhymes Poppet paper doll series is a Gretel costume from the tale of Hansel and Gretel. Recorded by the Brothers Grimm and published in 1812, Hansel and Gretel are a young brother and sister captured by a cannibalistic witch living deep in the forest in a house made of candy and gingerbread. The two children save their lives by outwitting the witch and their own cruel parents. The story is, like a lot of fairy tales, a bit dark. When I was working up my list of fairy tales, I had not intention to originally include Hansel and Gretel. It’s just not a fairy tale that I really love. However, it is a fairy tale with a child protagonist and a pretty strong female character, as it is Gretel who pushes the cannibalistic Witch into the oven. So, it seemed like a fitting on to do. I wanted to use the colors of ginger bread in this Gretel costume, so I stuck with brown, cream and red. The edge of her skirt is decorated with gingerbread men and peppermint candies, mostly because I knew I could draw them. The shape of the jumper is based on braces used with lederhosen. I don’t know a lot about Bavarian clothing, ain’t gonna lie, but I’ve always liked the suspenders/braces that go with lederhosen. Please think about donating through Patreon, it really does help. Plus you get access to the behind the scenes blog, here’s two I’ve opened to the public- sketchbook photos and Some Stuff about my Process. It seems somehow wrong to create a Snow White paper doll without giving her super pale skin, black hair and red lips. Her skin isn’t actually white, but it is fairer than any of the other skin tones I have ever done for the Poppets. So, she won’t be sharing shoes that show flesh with anyone. For her dress, I wanted to show some of forest elements that are so integral to the story, hence the trees and butterflies. In the 1857 version of the tale there are three attempts on Snow White’s life. The first is with a bodice lace (like a shoe lace but for a corset) that is laced so tight it strangles her. The second is with a poisoned comb and the third is the apple attempt. I did not draw a comb, but I did was to give my Snow White paper doll a lace up bodice to reference that first attempt. Of course, the 1857 version also ends with Snow White and the Prince torturing the Evil Queen to death with red hot shoes. As usual, older Fairy Tales are a trifle violent and rather dark. Meanwhile, if you want to support the blog, then think about donating through Patreon. If you’re not sure wha the behind the scenes blog posts are like here’s two I’ve opened to the public- sketchbook photos and Some Stuff about my Process. While I have abandoned my sets, I haven’t really given up the whole themes for paper dolls idea. The truth is that I like themes. They help me keep my head on straight and they give me something to draw when I don’t know what to draw. At the end of 2016, I asked my Patrons what they would like to see in 2017. I got requests for fairy tales from several of them. Well, fortunately, I already had plans for introducing a Poppets Paper Doll year long Fairy Tale and Nursery Rhyme theme. This might last longer than a year, but I am aiming for a year. Who knows? I can be fickle. I knew I wanted to do something that felt a little vintage and old fashioned without actually being historical. The nursery rhyme was first published in the early 1800s, but the exact age is unknown. I wanted to be traditional in my depiction of Little Bo Peep. Also, I got to draw lots of tiny sheep. You can check out my Fairy Tales and Nursery Rhymes board on Pinterest to see some of my inspirational images. Plus, there are hints at a few other fairy tales and nursery rhymes I am planning to feature over the course of the year. Which brings me to my next point, is there a fairy tale you’d like to see the Poppets get an outfit from? Let me know in a comment. Meanwhile, if you want to support the blog, then think about becoming a Patron or liking it on facebook. Mostly, I am using Facebook to share stuff from the Archives, but there is something specific that you’d like to see on the page, let me know in a comment. I am very new to Facebook.